The Giant in the Threaded Insert business. 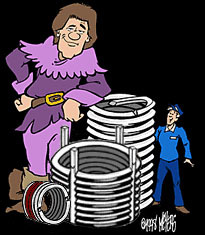 • Precision Thread - Helical coils of diamond shaped 18-8 stainless steel, phosphor bronze or Inconel X-750 wire. • E-Z Fix - E-Z Lok type inserts with dry epoxy adhesive, available in carbon steel or 303 stainless steel. The adhesive seals against liquid and gasses and bonds to virtually all metals. • Rock Solid K Type - Inserts with key-locking pins available in carbon steel or 303 stainless steel. They provide a positive lock to the mating part.